When pregannt the one thing that everyone warns us about that we don't really understand until we have had children is how utterly and heartbreakingly quickly they grow up. Each and every stage is a delight as you watch your little ones learn, explore and develop. Taking quick snaps on the go and videos that catch children doing something funny or special couldn't be easier these days with the majority of parents having a mobile phone in their pocket. If you are recording memories this way make sure that you back up photos and videos regularly, using whatever system your phone provider / manufacturer recommends or something you are happy with. A lost or damaged phone could mean losing pictures that can't be replaced so don't take the chance! Dropbox and Onedrive both offer fantastic cloud back-up options. If you are a photo taker by all means enjoy sharing these online with friends and family. Make sure that you also print some of them off too. You can print from home fairly easy these days, in stores such as Boots or using an online developer, many of which will run regular special offers and freebies on prints and will help you convert your pictures into keyrings, canvas wall art, mugs and more if you want to. One of the scary things about children is how they go from tiny tots to strapping tweenagers in what seems to be a blink of the eye. 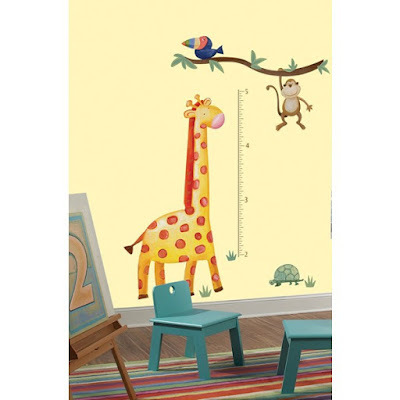 Height charts are a great way to keep tabs on how quickly they are shooting up as well as looking fabulous in any playroom or bedroom. With so many memories to keep track of why not keep a journal or a scrap book? This may be a great way to record such things in a fun and personal way. Some prefer baby books or record books while others go all out with papercraft, photos, buttons, stickers and more. Either way produces something great to look back on and older children will no doubt enjoy help you putting these memory books together. How do you remember and record special memories from your children's early years (and beyond?). Marking milestones needn't be a chore and there are so many fun ways to do it. Check Pinterest for inspiration if you are looking for something a little more quirky.